Khalistanis and Pakistan-backed factions routinely burn our Tricolour on the streets of London. Yet, the British look away, despite India's 'special relationship' with the country that hosts such elements. 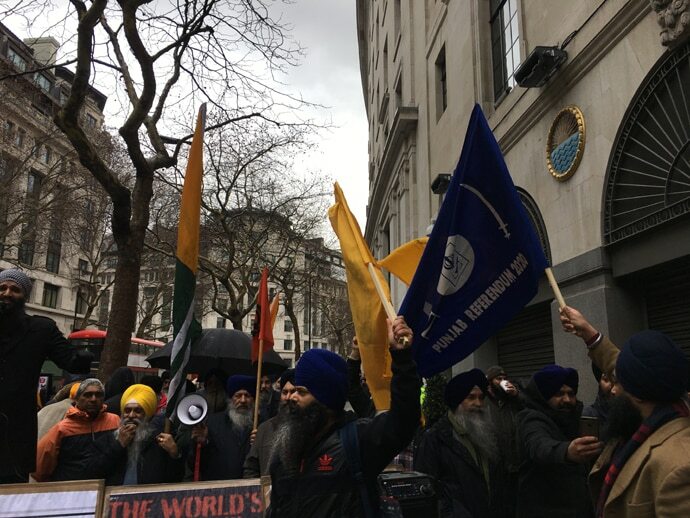 On January 26, a part of a half-burnt Indian flag was put around my neck while I was doing a piece-to-camera outside the Indian High Commission, London, where a bunch of Khalistan and Pro-Kashmiri Independence protesters were present. They were just a handful in number, but made a big noise, burnt and then stomped on the Indian flag (mainly for the benefit of the camera, I feel). Come January 26 or August 15, burning, desecrating and disrespecting the Indian flag has become a ritual for these factions in London. It happened last year. It happened when Prime Minister Narendra Modi came to the UK. At Parliament Square, out of all the countries in the Commonwealth, the Indian flag was pulled down from the pole, cut into pieces, burnt and stomped on. I tried reporting – and was abused. The police were present but no outcome followed. The Foreign Office later apologised for the incident (April 2018) and this time around, it has said that it allows peaceful protest and does “not condone” the burning of national flags. In the name of freedom of speech – one of the pillars of democracy in the UK – the Indian flag is burnt and disrespected. And when we report, protestors call us names, harass us by following and intimidating us in all possible ways. But, of course, that does not apparently amount to 'disorder' or 'crime', and so, no action is taken. These factions are blatant and boastful about the whole thing. They take pains to declare it over social media (tagging us) beforehand. The Indian High Commision as a routine raises objections to such demonstrators and these protests being held – and as routine, their requests are turned down. It's no surprise then that this has become somewhat of a ceremony for separatist factions and for the consumption of the media. The Indian authorities will take this up again. There will be an apology issued – and as usual, no action will be taken. No wonder then that London has become the focal point of such separatist activities. 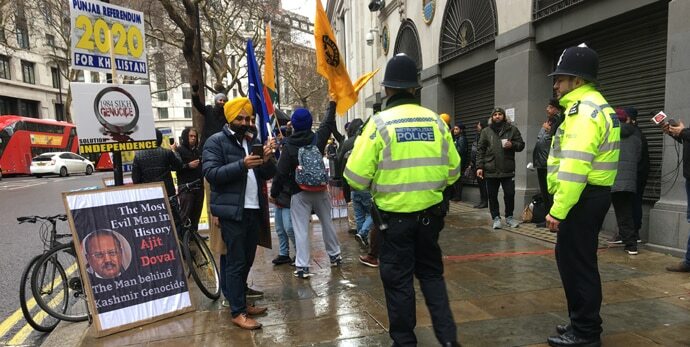 London was the place chosen for the launch of 'Referendum 2020' on August 12, 2018, when, at Trafalgar Square, separatists asked for a vote on carving out Khalistan from India. All sorts of 'anti-India and ‘pro-Khalistan' sloganeering happened. In the 2020 Referendum event, there were more separatist Kashmiri flags (inspired by the Pakistan flag, crescent and the star with white stripes and yellow added on the side) than the yellow Khalistan flags. How do the two movements come together? What is the connect? The organisers of the January 26 event, Zafar Ahmed Qureshi and Ranjit Singh, said that issues have an obvious "common cause" – that of "self-determination" against a "common aggressor", India. One does wonder if a more appropriate place for them to raise their voice and intent would be India, at least, for the launch of such a referendum. Getting traction in the international community is, of course, an aim but, more importantly, it is a convenient place as a lot can be said and the pride of a nation – its flag – can be disrespected without any consequence. Not only that, people do it blatantly and own it. “In front of the Indian Embassy I did burn the flag, who wants to arrest me? Come on, arrest me,” said one of the protestors to me this Republic Day. When the same happened during the Commonwealth Heads of Government Meeting (CHOGM) 2018 when PM Modi visited, it came as a shock then but not now as it's ‘routine'. Even then PM Theresa May had apologised but no action was taken – and it happened again. Members of Parliament I have spoken to do tell me in confidence that ‘action should be taken and they can’ but where is the impetus in the UK government to do this? Surely it does impact the relationship between the two countries though, especially at the most crucial juncture when the UK needs the world more than ever before. Catherine McGuinness, the policy and resource leader of City of London Corporation – effectively the political leader of London’s 'square mile' – is in India as we speak to strengthen the relationship between the two countries. Ms McGuinness has expressed how important the relationship between the two countries is and how much she is looking forward to visiting India again to further the partnership between the countries. The historical relationship between UK and India is talked about so much – but when it comes to situations like these, why does the UK government not go beyond an apology? Whenever I go to report, I expect to be hounded. I know verbal abuse will be hurled at me. I will be followed, called names and the police will keep an eye on me. The protestors will follow me during and after the shoot and the policeman will follow them to save the situation from blowing out of proportion. On January 26, 2019, while reporting outside the Indian High Commission, all of this happened – apart from a burnt flag being wrapped around my neck. But this time around, as I was picking up the pieces of the burnt Indian flag, a policeman helped me. When a flag of one country is disrespected in another country, the pride of both nations is challenged. If no action is taken, the day is not far when Britain will have to bear the repercussions of these activities. After all, this small minority of separatists are residents of Britain, not India. Also read: Can Priyanka Gandhi defeat Narendra Modi in Varanasi? Author is foreign correspondent for India Today Group.